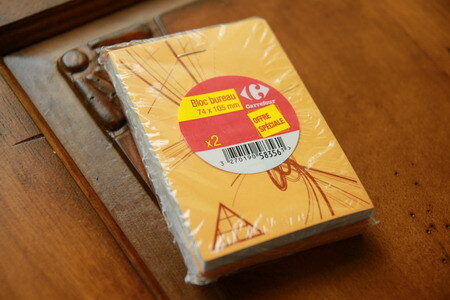 On a recent trip to Belgium I saw this pack of notepads in a Carrefour corner shop. Carrefour is one of the largest supermarket chains in the world, but there are many countries where they are not present (yet). These Carrefour notepads seem to be available in France, Belgium, Switzerland and Italy. 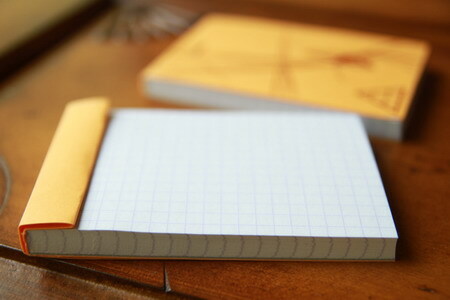 The notepads use 80 g paper, are A7 size and have 160 pages. 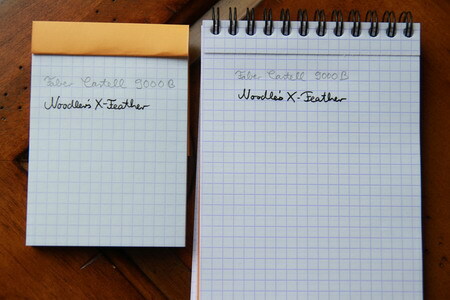 The orange-coloured cover and the purple (5mm) grid are very similar to Rhodia paper, but even though these notepads are made in France neither the orange nor the purple match the colours of the Rhodia notepad I have at home, so I cannot be sure whether the paper is made by Rhodia or whether it is just a look-alike. The cover is pre-folded, making it easy to fold it back when writing. The paper has the same weight as Rhodia paper, but the surface of the paper, as well as the shade of white is also different, making me think it is not Rhodia paper. 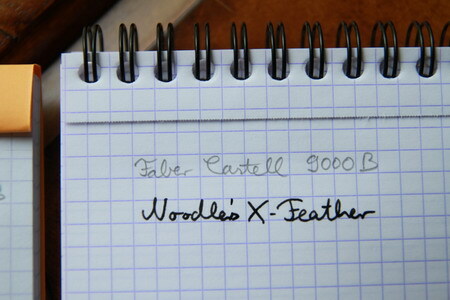 Nevertheless it is very nice paper, it is quite cheap and copes well with pencil and ink. 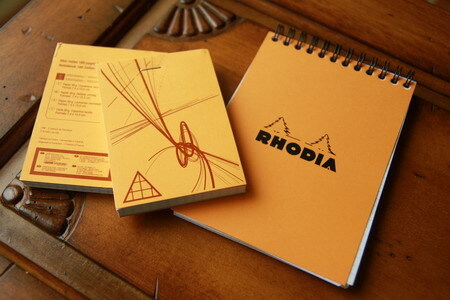 If you know whether it is made by Rhodia please let me know. I must keep a lookout for this the next time I go to the local Carrefour! Thanks! Carrefour dipped a toe in the UK market in the 1980s, but for some reason the venture was not terribly successful – probably something to do with an already-crowded (super)market. I wish Tescos or Morrisons would stock items like this, rather than their wretched own-brands. memm, do most carrefour you visited carry carrefour notebooks? Is the pad in your post the only offering in the store or was it one of many? There’s no Carrefour in Canada, but at Basque Country this summer I picked up an A4 hardcover spiral bound Carrefour notebook. 120 pages of 70 g paper, vertical edges are colored. Not a fancy notebook but I kinda liked it. Ruby, they are definitely worth the money! Stationery Traffic, oh I didn’t know. Thanks for sharing this with us. Claire, unfortunately there’s no Carrefour in the UK and in Germany. Belgium was a one off trip. I just checked and found out tthat they also left Switzerland. My only chance to visit a Carrefour is probably in China, but Carrefour in Shanghai doesn’t carry these notebooks – or at least they didn’t use to. I haven’t been to a Carrefour in Shanghai for a few years, but should try to visit one again next time I’m there. I wonder whether all their paper is from the same manufacturer. 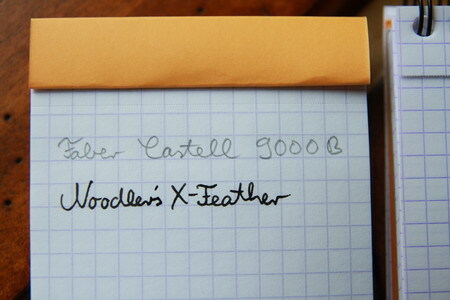 Did your notebook say it’s made in France? Interestingly this notebook only says it’s made in the EU, ‘Fabricado y envasado en la U.E.’, but the address is one in Madrid.